What kind of hopes fill our life? We may hope for a good job or a perfect relationship. Some may have simple hopes, like catching a bus on time. Others may have lofty hopes like winning the lottery. Whatever our hopes, I suspect it is rare for us to go a few days without expressing a hope for (or in) something! But those hopes -- some good and others bad -- are different from Christian hope. They are far from what Pope Benedict XVI calls in his second encyclical 'Spe Salvi' the great hope -- God! 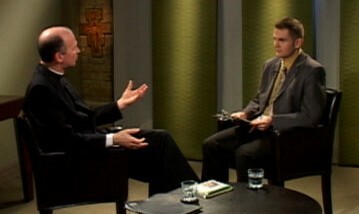 This Wednesday and Thursday on Catholic Focus I'm joined by Father Roger Vandenakker, C.C., to explore 'Spe Salvi.' Fr. Vandenakker is the Catholic chaplain at York University and a familiar face to many Salt + Light viewers for his participation in the program "Food for Life." Together we work our way through the encyclical exploring many facets of hope. In the first part we discuss hope in the New Testament, hope and its relationship to faith, our call to be witnesses of hope, and hope in eternal life. Hope and its relationship to prayer, suffering, and baptism are explored in the second part airing on Thursday. These are just a few areas we touch on, as we pack many hopeful thoughts into the two episodes! Join us for the two part "Catholic Focus: The Great Hope" airing Wednesday January 30th and Thursday January 31st at 7pm and 11pm ET, with an encore presentation this Saturday and Sunday at the same times.